Three hundred and twenty light years away in the Centaurus constellation sits one of the strangest planets humans have ever laid eyes on. It’s four times as massive as Jupiter and orbits twice as far out as Pluto—around one of its three suns. Using a new instrument at the European Southern Observatory’s Very Large Telescope, a team of astronomers has spotted a planet in an exotic triple star system; it’s only the second such exoplanet known to science. And unlike the first triple-star exoplanet—which orbits very close to one star and very far from the other two—planet HD 131399Ab is gravitationally influenced by all three suns. Until now, astronomers weren’t sure such a planet could survive. Although astronomers have discovered thousands of exoplanets by transit photometry, only a handful of these worlds have been imaged directly. You can think of direct imaging like trying to see a firefly from a lighthouse 1,000 miles away—an extraordinarily difficult thing to do. The only exoplanets we’ve imaged thus far are larger than Jupiter and sit in a comparable or wider orbit, where the glare of the parent star is less intense. But as our instruments have improved, so has our ability to see a broader diversity of exoplanets, including some in multi-star systems that pose the added challenge of multiple sources of scattered light. In 2014, the ESO’s Very Large Telescope was outfitted with a new instrument called SPHERE, which features an adaptive optics system for cancelling out the distortion of Earth’s atmosphere, as well as an instrument to block starlight, called a coronagraph. The VLS is one of the most powerful direct imaging tools planet hunters have at their disposal, and it bagged an exotic triple-star exoplanet on its very first observational campaign. 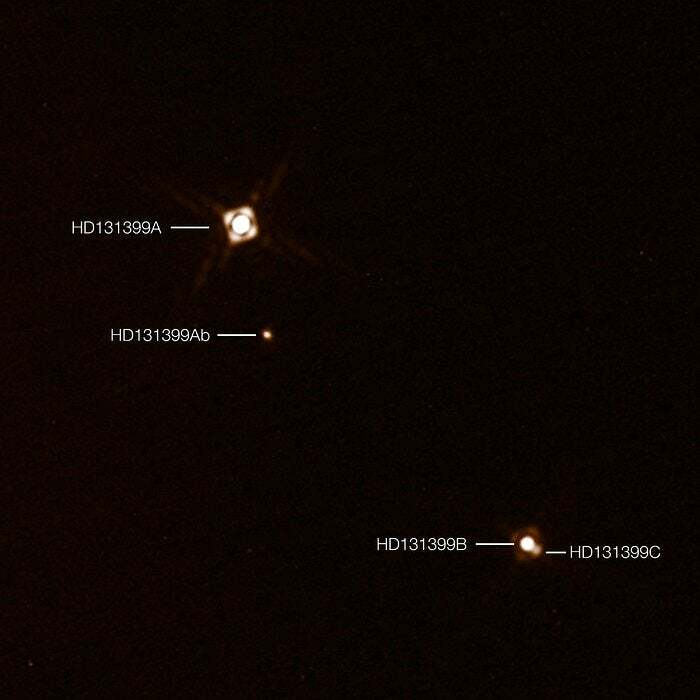 HD 131399Ab in the triple-star system HD 131399, as imaged by the ESO’s SPHERE instrument. It lies 80 AU from star A, while the binary pair B/C lies in a more distant orbit, also around star A. Image: ESO/K. Wagner et al. Wagner is continuing to refine HD 131399Ab’s orbit to determine whether the planet will be stable over the long-term. But while its fate and the fate of triple star planets across the universe remains a question mark, that shouldn’t stop us from imagining what life on such a world would be like. In essence you’d have two seasons: one with three sunrises and sunsets every day, and another of perpetual daylight, where a rising star (or stellar pair) is always there to replace a setting one. Now if that doesn’t make you want to hop in a spaceship and explore the universe, I don’t want to know you.